As you’ll probably know if you’ve read many articles on this site: I’m a computer programmer and general ‘geek’. So, it won’t surprise you to know that I am quite interested in how computers work – and picked up this book thinking that I’d already know quite a lot of it. I knew a fair bit – but I learnt a huge amount from reading it, and it helped me gain a full understanding of what is going on when I write computer programs – right down to the level of the electricity inside the processor. By the end of the book I was itching to buy lots of relays or transformers and make a computer on my living room table! The book starts by looking at the ways you, as a child, might try and communicate with your best friend who lives across the street – after your parents think you’ve gone to bed. 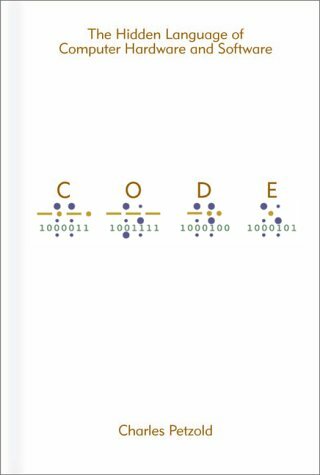 The natural solution to this is Morse code using a torch, and Petzold takes this simple code as a good starting point to explain the concepts of a code. He then moves on to Braille, which is significantly more complex than I thought, and which gives the opportunity to look at some of the more complex things you find in codes (eg. shift characters and escape characters – both of which Braille has). You’ll note that nothing about computers has been introduced yet – and that is a key feature of the first part of the book, it doesn’t go straight in to “this is how a computer works”, it starts at a very basic (but still interesting) level that becomes useful when thinking about computers later in the book, but isn’t too scary. Electricity and electrical circuits are introduced when describing how you might communicate with another friend whose window you can’t see from yours. This is introduced almost entirely from scratch – explaining how circuits work, what voltage is, how batteries work etc – but it actually went beyond my previous knowledge in electricity fairly quickly, and taught me much of interest. Whenever circuits are drawn in the book – from here onwards – they are shown with the wires that have current in them in red, making it very easy to see what is going on. I’m not going to go much further into detail about the rest of the book, except to say that you move towards being able to ‘build’ (conceptually if not actually physically) a fully-working computer gradually, one step at a time. From logic gates, to adding circuits and subtracting circuits and from clocks to flip-flops and RAM you gradually work up to a full, programmable computer which you have basically built by page 260! Given how much detail everything is explained in – and how little knowledge is assumed – fitting it into 260 pages is very impressive! Of course, the book continues past page 260, going on to cover topics including input and output (from keyboards and to the screen), high and low level programming languages, graphics, multimedia and more. Interestingly, transistors aren’t mentioned until after you’ve got almost all of the way to building a computer – but this is almost certainly because relays are far easier to understand, and accomplish the same job. Once they have been introduced, a couple of important processors (the Intel 8080 and the Motorola 6800) are examined in detail – a really interesting opportunity to see how the concepts you’ve learnt about have been applied in real life by chip designers. I can think of very few issues with this book – although the last chapter does read rather strangely, as if the author was trying to fit far too much into far too little space (trying to cover multimedia, networking, WIMP interfaces and more in one chapter is a bit of a tall order though! ), but I very much like the book as a whole. It is one of those rare books that is suitable for a very wide range of audiences – from those with almost no knowledge of the subject at all (it starts from the very beginning, so that isn’t a problem) right up to those who are experienced programmers and know some of it (they will still find a lot they don’t know, and realise a lot of things). Overall: a great read, very interesting and very educational. You won’t be disappointed. Its really hard to understand chapter 17 ,help? Much appreciated, thank you!